I have always loved the build up to Christmas, possibly more than the day itself. This year is no exception and I love seeing the excitement build through the eyes of my children. 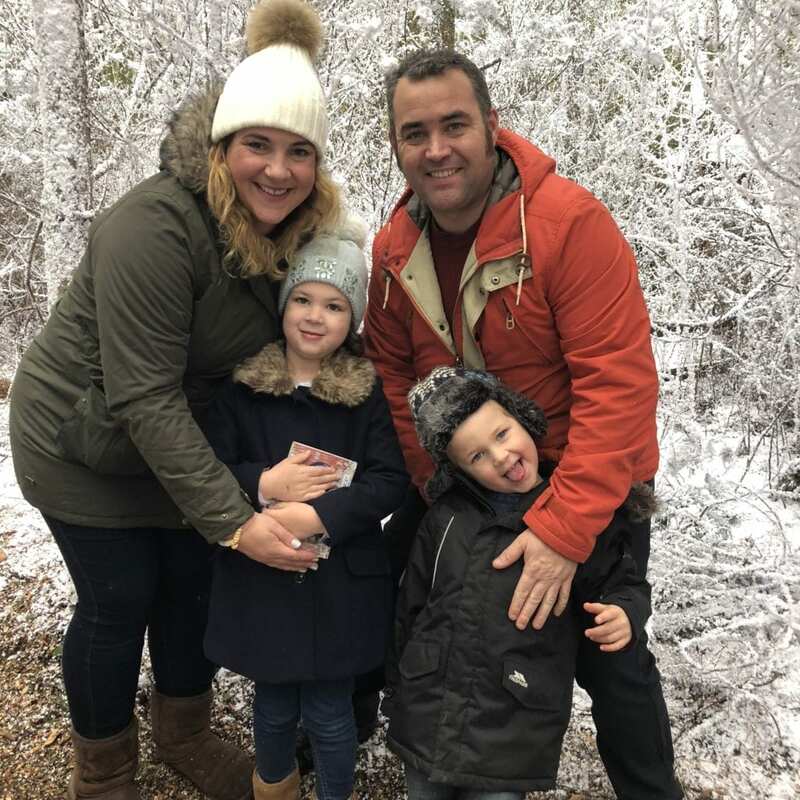 At 4 and 5 they are old enough to understand what Christmas is all about, but young enough to immerse themselves fully in the Christmas magic. 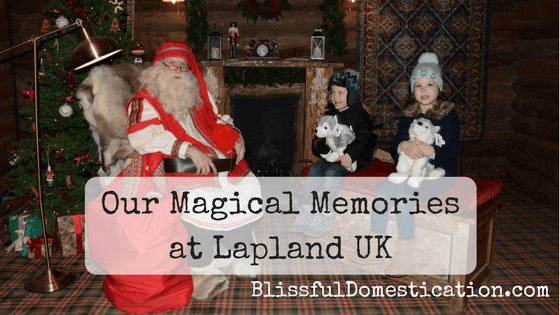 This year we were lucky enough to have been invited to Lapland UK. I have read about this magical place before, and have wanted to go for years, so I was beyond excited. 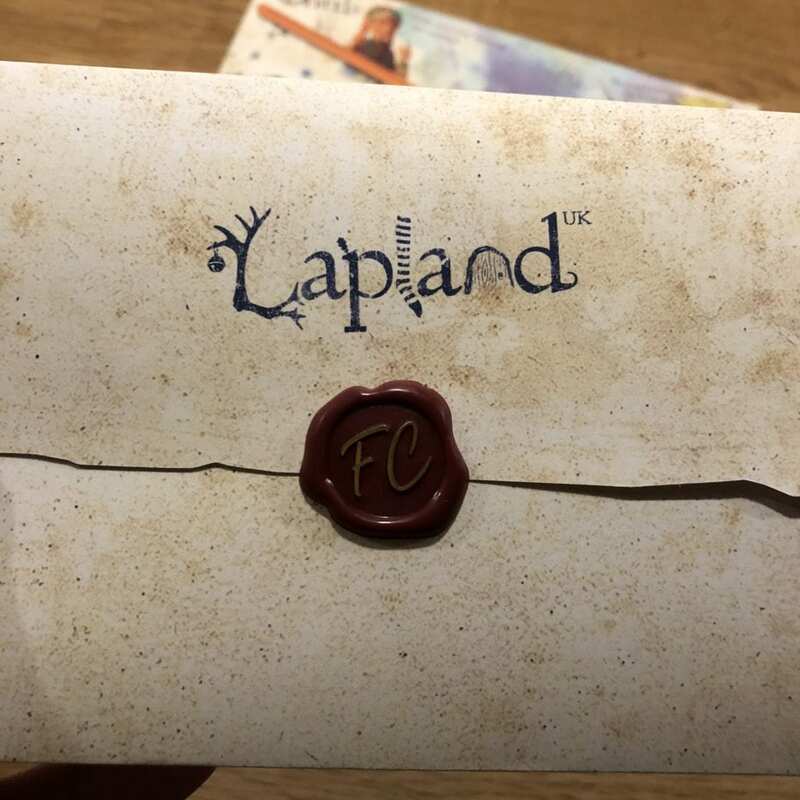 The invitations arrived addressed to the kids and had a traditional wax seal from the big man himself. 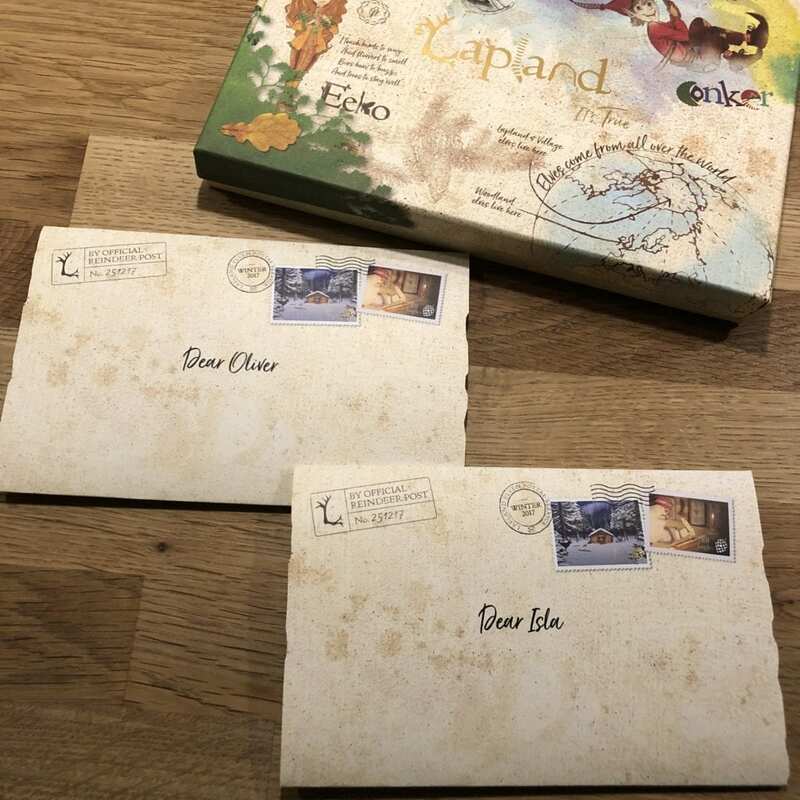 I made the decision to keep the invites from them until the morning of our visit, purely because they don’t cope well with too much excitement, and I wanted them to have a good nights sleep the night before. 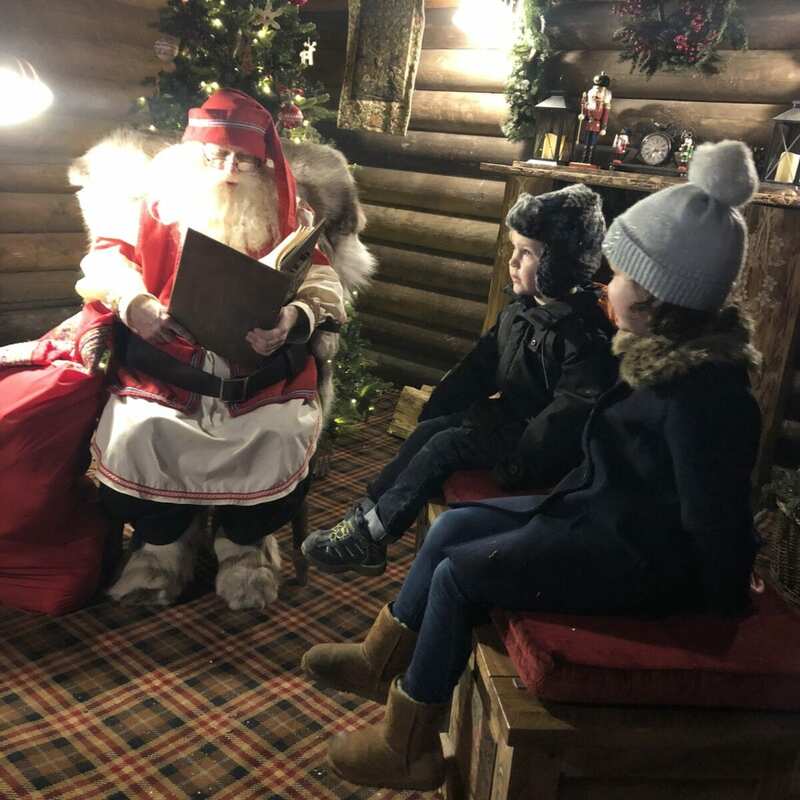 Isla read hers aloud for Oliver to hear and explained to him they needed to go and find the magic door to Lapland so they could help Father Christmas. So off we set in the car and started our 2 hour journey to Ascot. On the way we talked about the different elves we were going to meet, and I showed them the drawings of the characters on the I-pad to build the excitement. Put your thumb on your nose, and wiggle whilst you grin! 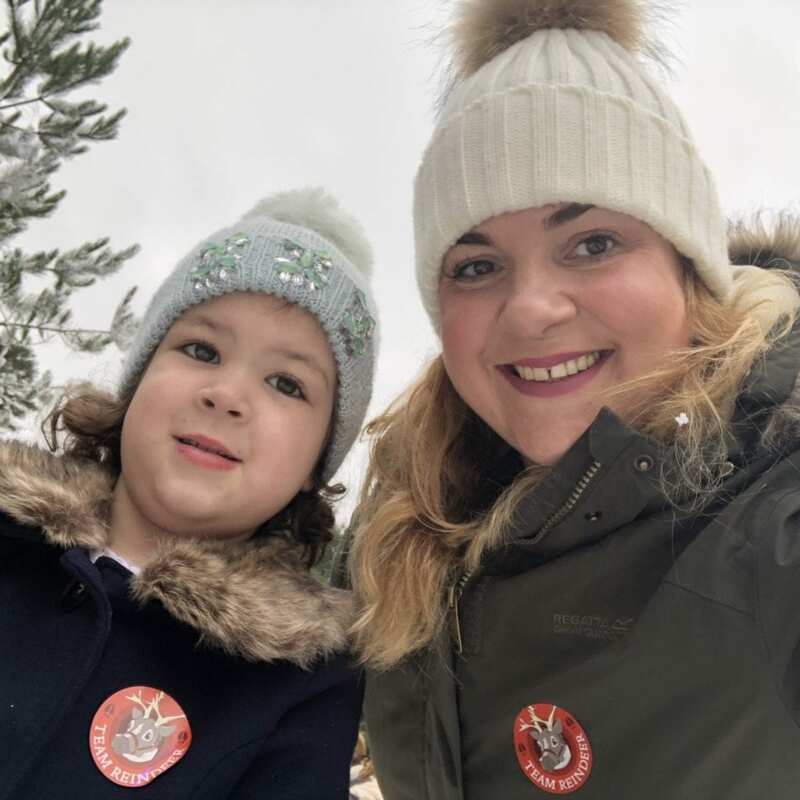 They gave them passports to Lapland along with a little pin badge of two of the Elf characters. Even grumpy pants Daddy got into the swing of things and bought himself an Elf hat (under a little duress!). 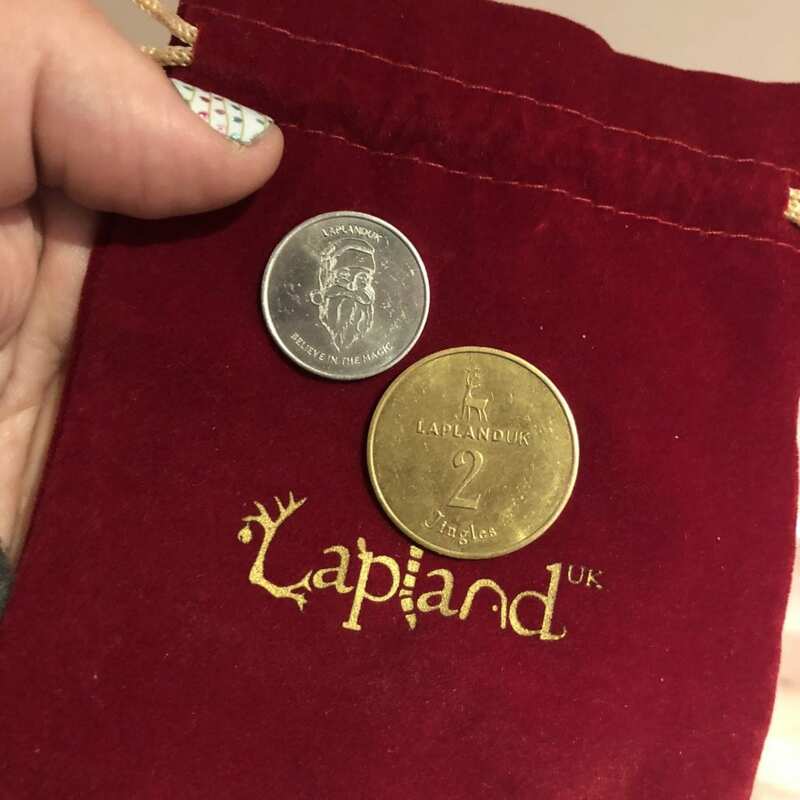 We also changed some money into ‘Jingles’ the Elf currency used in Lapland. They were given to us in lovely little velvet pouches, one each for the kids. When it was time magic doors hidden in what seemed to be a pile of old suitcases were opened, and we made our way along a fairy light lit path to a clearing in the Enchanted Forest. 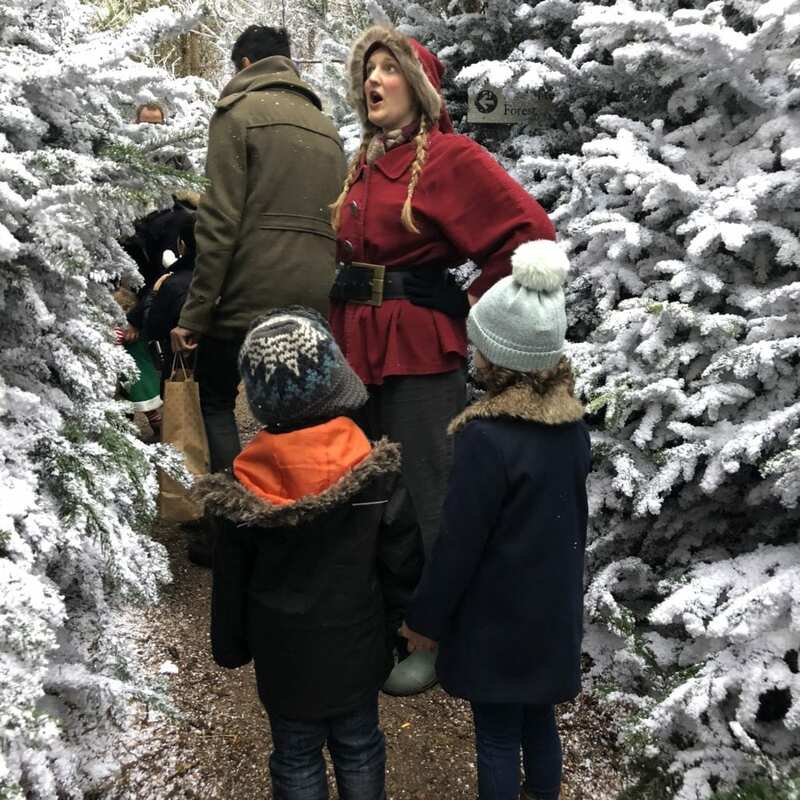 Here two woodland elves greeted us and started telling the story of the magic door of the enchanted forest that opens up into Lapland. When the door opened Lapland itself was as white as you would expect. By time we made our way through the door we were all really excited and had been swept up in the magic and the story. 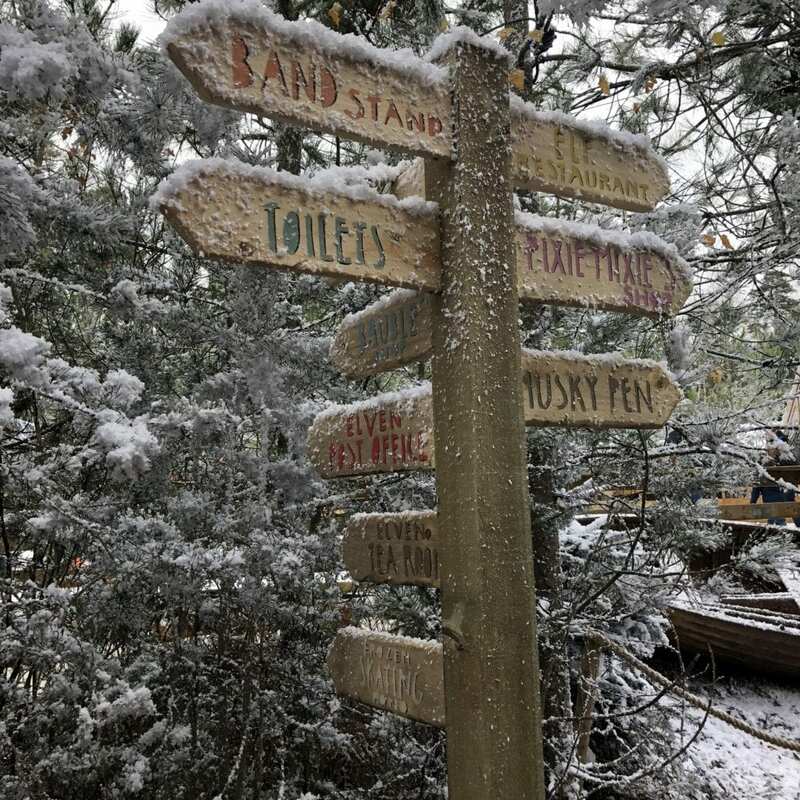 I was a little disappointed to find that the snow was fake, but I suppose real snow, even the man made kind wouldn’t be practically possible. The visual effect was still beautiful, Oliver was just a little gutted he couldn’t make snowballs! The first stop was the toy factory. I loved that the ‘small folk’ had their own mini door to go through, unlike the regular door for us ‘big folk’. 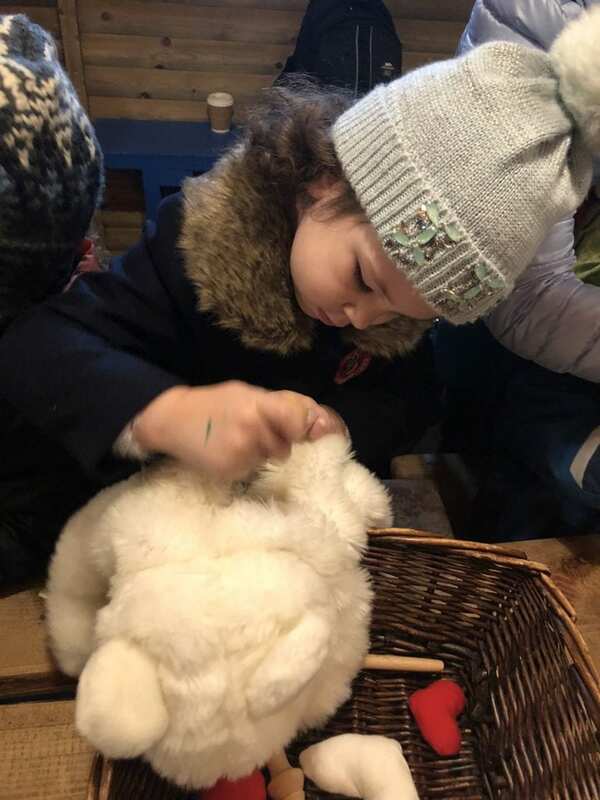 The story telling continued, and the children helped ‘Whittle’ and ‘Conker’ the Elves by stuffing some toy polar bears. Following the toy factory we headed to Mother Christmas’ kitchen. 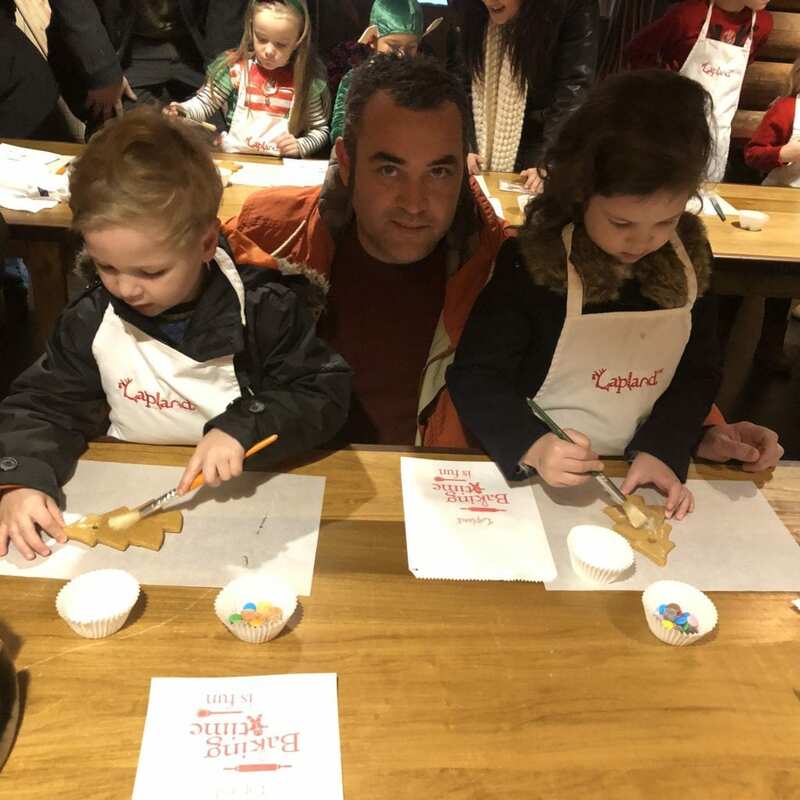 The ‘small folk’ decorated gingerbread Christmas trees with icing and sweets, followed by story time with Mother Christmas. After that we made our way to the Elf village, which was one of my favourite parts. Christmas music was playing and there was a real jolly Christmas atmosphere. 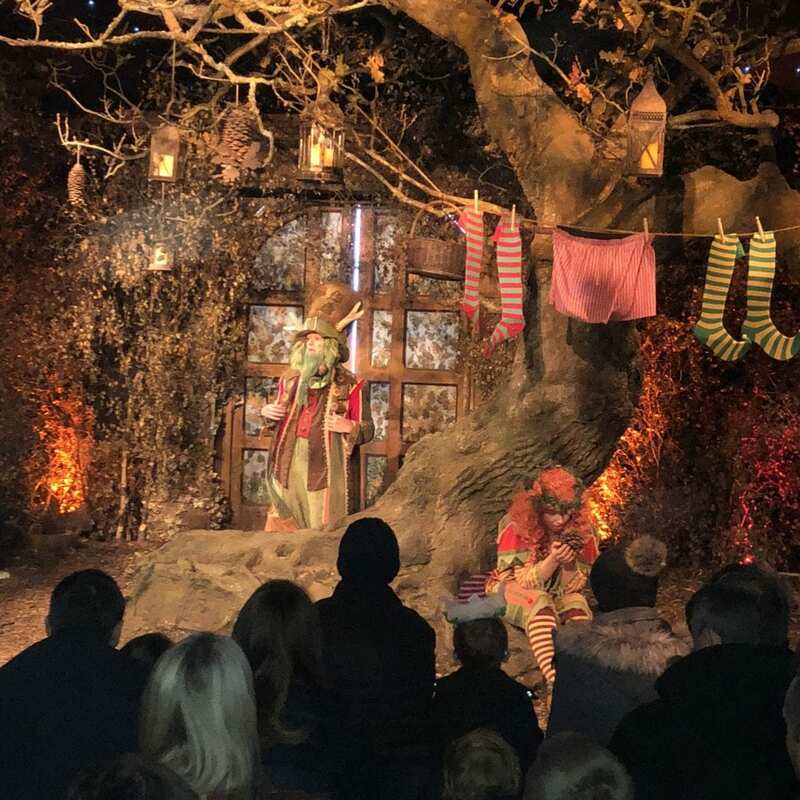 Elves wondered around, and served in the shops and the restaurant and not a single one faltered or came out of character, each greeting us with the Elf welcome. We had just over hour and half here before heading to see Father Christmas. It seems like a lot, but it went so quickly, and I personally would have liked longer to mooch around. 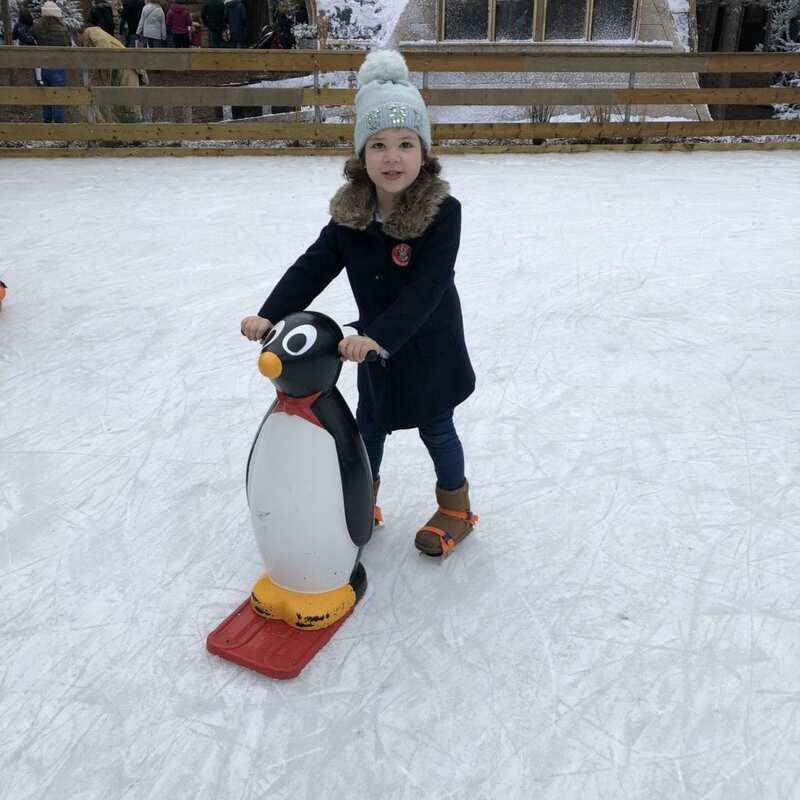 The first stop was the ice skating. The kids have always wanted to go and we just have never got round to it before. We also meet the huskies, saw Rudolf, posted letters to Father Christmas and a postcard to Nana and Grandad for 2 Jingles. In the Elf Emporium the kids collected their bells for helping in the toy factory and completing their Elf training, and they each bought an Elf tree decoration with their Jingles from the Bauble shop. 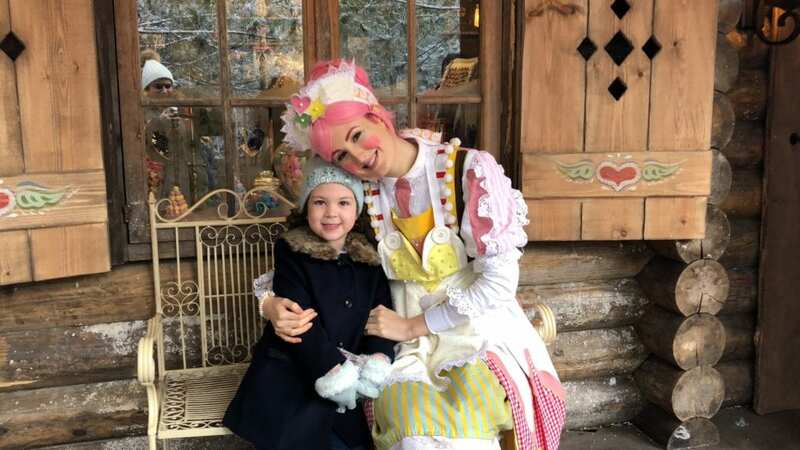 Isla’s highlight was meeting Pixie Mixie outside her sweet shop. I love this photo of her warms my heart, she looks soooo happy, and she skipped away from her at the end. When it was time we started making our way towards Father Christmas. We walked along snowy paths, although the kids were practically running with excitement. Winding through trees until we came to the Reindeer enclosure. Here we made some magic reindeer food, which we will use on Christmas Eve to show the reindeers were to land and give them more magic to continue on their journey. 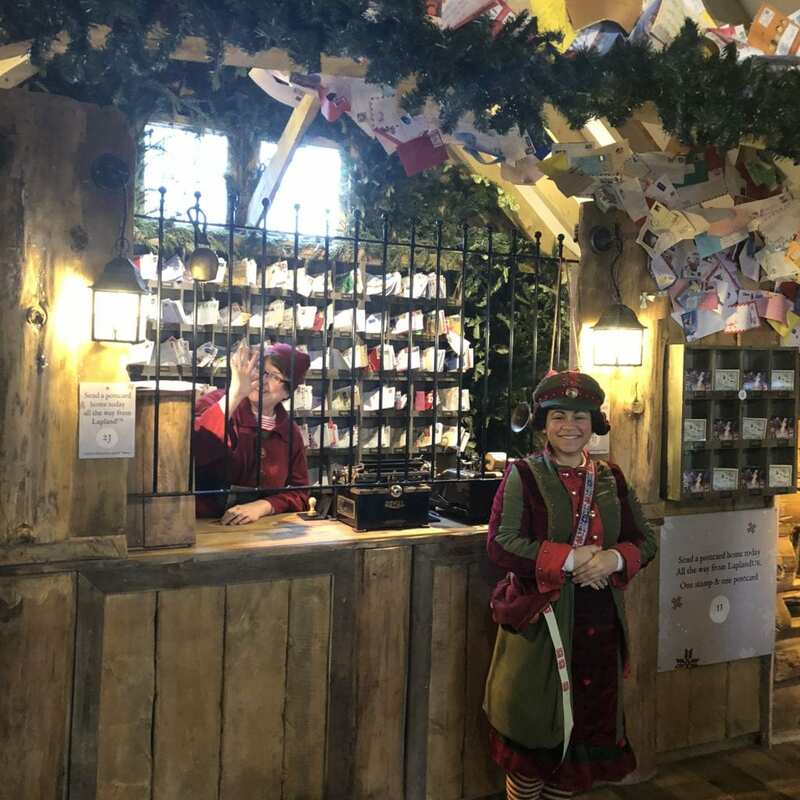 We made our way to a wooden building where we checked in, and waited a matter of minutes before a very cheerful elf called out Isla and Oliver’s name. I have never seen Oliver so engaged before, the Elf chatted to them as we walked through narrow windy tree lined paths, and they told her all about Ice skating and putting hearts into the soft toys. When we reached Father Christmas’ cabin the excitement and anticipation was palpable, and the door slowly creaked open and an Elf invited us in. The cabin was exactly how I would imagine Father Christmas’ home to be. Warm and cosy with a fire and Christmas tree. Santa himself looked very authentic sat on his chair with fake fur throws. The children looked at him in awe, and disbelief when he knew their names. Oliver couldn’t believe he knew he had a cuddly Pterodactyl called Terry and that he liked looking for secret hideouts, and he also knew Isla liked to dance. They sat and listened to him and gasp in amazement when he showed them their names on his good list. There faces lit up, the magic in their eyes said it all, and I felt a little lump in my throat and a sting in my eyes. 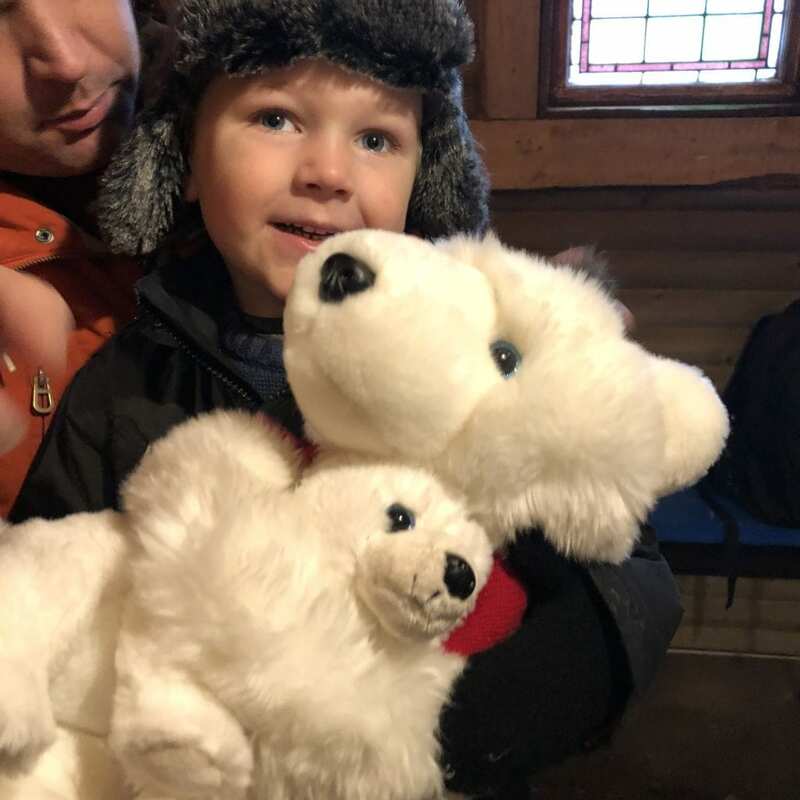 Father Christmas then produced a lovely plush Husky toy for each of them, which I feel may be a favourite toy of theirs for a long time coming. 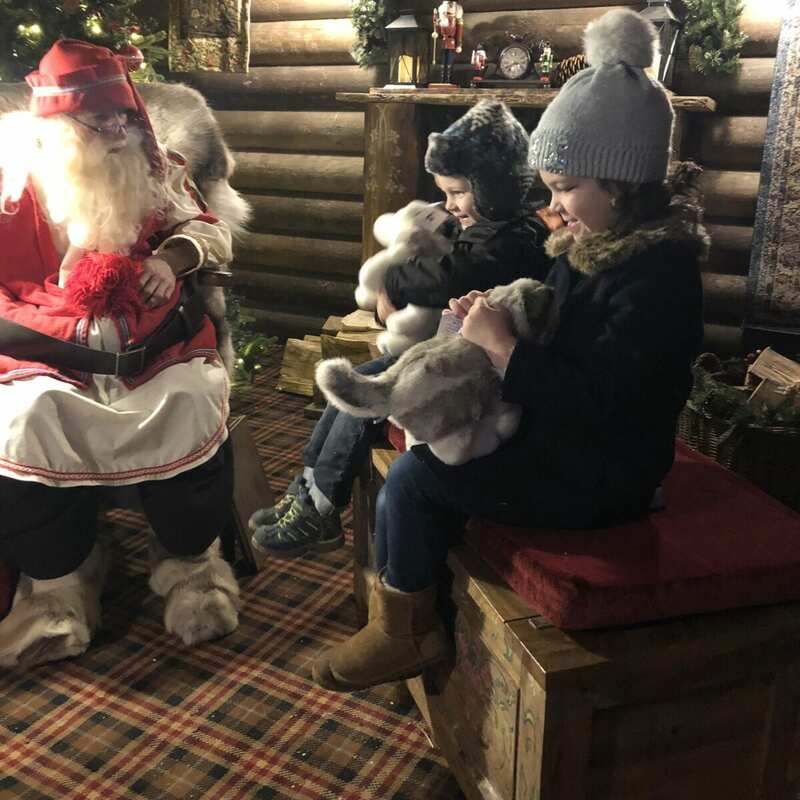 We made our way to the exit, and although you receive one complementary photo of your Father Christmas visit (and of course you can take your own), we decided to buy the package for £20 which was 3 prints, and digital copies of all 6. We bought collars and leads for 3 Jingles each for the two Huskies, and headed home with two very content children, and a warm fuzzy feeling for us. 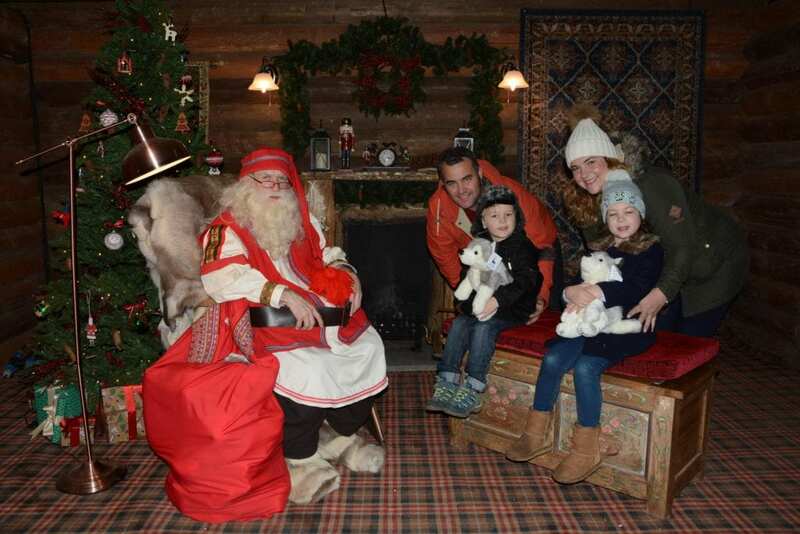 Lapland UK is truly a special place, and they have really captured the excitement and magic of Christmas. The whole experience last 4 hours, but there is a lot crammed in to that time. We have some lovely memories, and great photos and video of our trip. I have made a short film that hopefully gives you a taste of the magic of Lapland UK. The attention to detail is great, and as I mentioned before all the Elves were amazing. Not one was out of character even for a second, and they were all happy to spend time talking to the children and pose for photos. It was very efficiently run, we didn’t have to wait for more than a few minutes for anything including the ice skating, in the restaurant and the Father Christmas visit. The Father Christmas himself looked very authentic, and I loved the fact that he knew things about the children (thanks to answering a few short questions before our visit on-line). 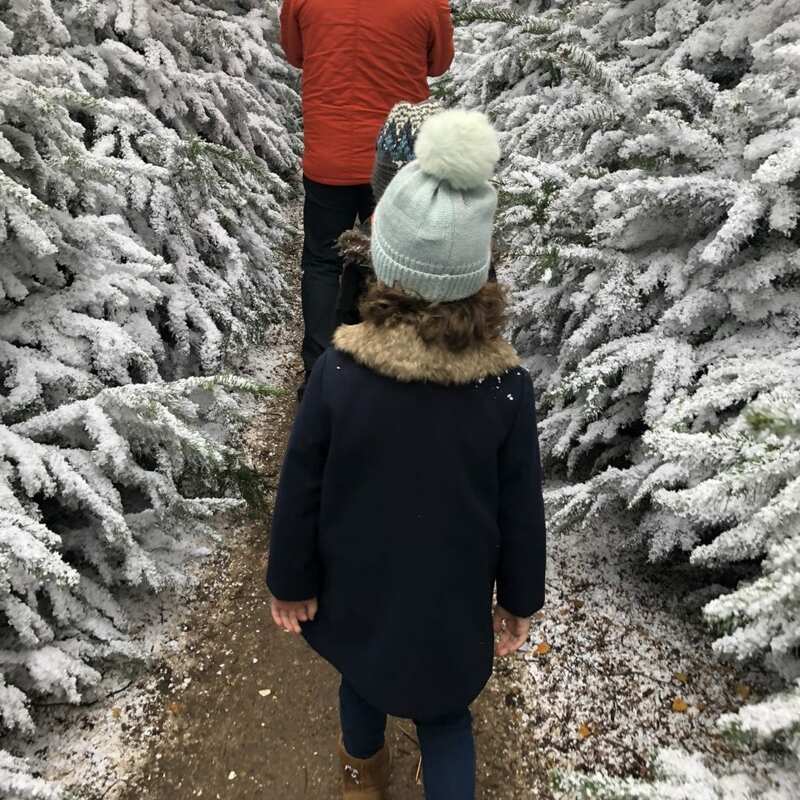 I have never felt emotional during a Father Christmas visit, yet this one just got to me, the setting, the build up and most of all my children faces of pure delight and wonder. The downside is the cost. Yes it is expensive, but I am a true believer in you get what you pay for. The kids definitely got their moneys worth, and for us having these memories are priceless. Someone said to me if you think of it as a 4 hour long interactive theatre performance with bells on then you can easily justify the cost. Would I go again? Absolutely, but I think I would leave it a few years. Part of the magic is not knowing what’s round the corner, and I would want to keep it ‘Special’. One thing I know though is that in years to come we are going to struggle to top this! 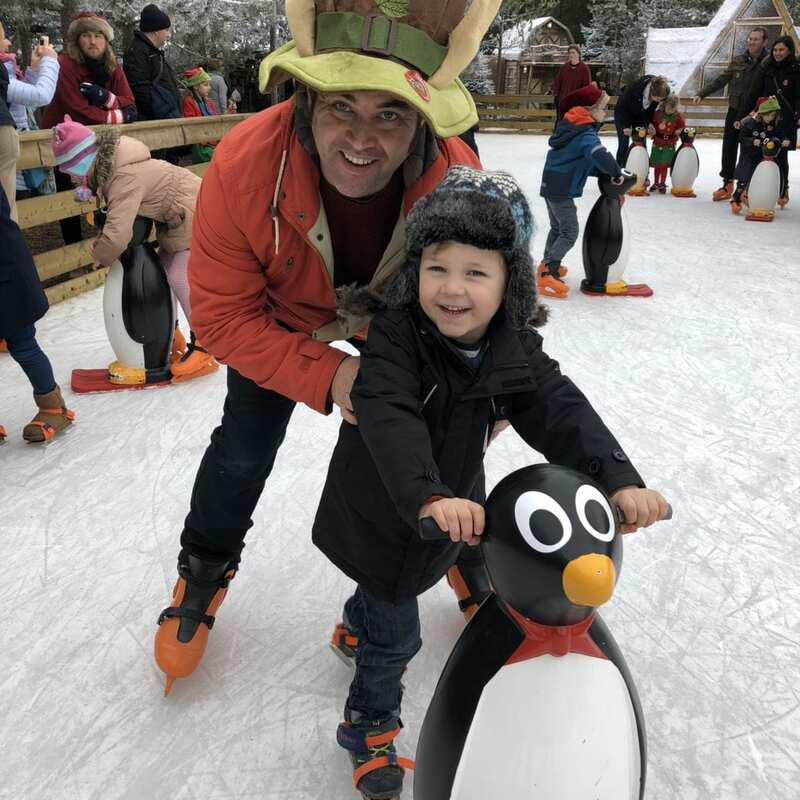 Disclaimer: we were invited to Lapland Uk for the purpose of doing this review, but all words and opinions are my own.